I currently sit surrounded by darkness writing this. By the time I actually publish, it will be hours (likely days) later in daylight but the timing of writing this is significant(ish) so I share this tidbit. Way back in year one, this whole idea was born from emotion. Our law enforcement community was getting hammered and I was just becoming more and more negative. I couldn’t stand it so when I arrived home from dropping my (then) 4th grader at school, I thought I’d see if some friends wanted to help take some cookies to the local sheriff’s department. As cheesy as that was, it was all I knew to do to turn my heart around so I just went with it. The response was overwhelming and told me that I was not alone in the way I was feeling that morning. I decided to roll with things and see how far we could take this crazy little idea. 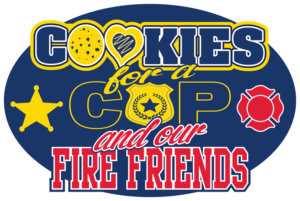 By day 4, we were at 75 departments covered – enough for 2 cookies per officer and civilian support staff at each stop. With 2.5 weeks to plan and organize, we delivered over 30,000 cookies. As I called local departments to get their head count, I remember a handful being cautious in their acceptance of agreeing to allow this gift be brought into their department. One in particular, downright refused and wouldn’t even allow us to have a delivery shipped in directly from one of those fabulous cookie delivery sites. There were some though that clearly felt quite moved by what was happening before them. One continued to ask if we were planning to share this with the media. I told him no. I worried that by going to the media, it would be saying “look at us”, something I genuinely did not want. He pressed, asking if he could reach out to them on our behalf and again, I declined. By time it was time to deliver, so many thought that it was important to share what we had collectively done that the media was contacted and they truly added to the fun and excitement of not only our journey but of those who saw the newscast and then got to meet us and our leaders along the way. I didn’t realize it, but it was here that relationships I / we would come to treasure were being born. The negative feelings I had felt just 2.5 weeks prior had in fact been turned around in ways I never expected. The God moments along the way not only caught my attention but also had me catching my breath. Countless moments honestly took the breath right out of me as I looked around with a “did that just happen” amazement and a few actually brought tears to my eyes. Our final delivery was on Christmas Eve that year, made while it quietly snowed and our family powered on with various treats purchased on the way because all other cookies has already been distributed. It was our mission to fulfill one last request to make sure some tiny little departments in Gallatin County, KY knew they were appreciated. As we headed home that day, we each sat in the car talking about all that had happened in the days prior, realizing what a special Christmas this had become for us and thinking that was it. It was here that I thought the story would have ‘THE END’ written but I soon found out that others would want otherwise. Once we all completed our mission at hand, I received email after email reiterating what I too had felt: We stepped up to do this for others but what we got in return was so much more than any gift we had given out. Campaign 2, campaign 3, campaign 4 all came and went (now in October of each year and now including our fire friends). Each campaign filled with emotion and stories we will forever treasure. As the years have gone by, I have found the demands of life, work, family and other community involvement to increase. I have been saying I intended to get other helping hands involved on the back-end and even have them lined up. (Hi helping hands!!! You know who you are.) The issue was that I had become so insanely busy that when I did have a day of downtime, I desperately needed to recharge. I’ve gotten to the point that I feel as though all I do is work – either with my full time position or with one of my various community ventures. Personal time and time to do things we enjoy in life have become more and more limited. I have realized that one needs time to train and ready those who will help you with not having time. Crazy how that works. To date, all of the back-end happenings: the website, the social media, the approving of the leaders, the organizing of our local sorting event where we sort over 15.000 cookies annually, the creation of the massive local wish-list of supplies, leader kitchen, the tracking of every detail and every single cookie, everything – it was all done by one set of (tired) hands. Those hands have always been powered by YOU, the law enforcement community, the fire community, the leaders, the countless thousands who come together to never be known in the grand scheme of things to do so much good for those in your community and, our amazing sponsors. When I take in the enormity of what it takes to pull this off, I am blown away. I share this because I want you to understand where I find myself now as we enter campaign #5. We are just 2 months out from our expected delivery and I have yet to do much for this year – a year that is potentially a biggie for us. I have been super conflicted this year. I have been back and forth and at moments convinced myself that I was shutting things down – not even making it to delivery time this year. This pained me greatly because not only do I have so many who look forward to this (myself included) but I also have a son who has begged me to not let this go. I have other local youth who have specifically pleaded to keep it going because they love it so very much. They (WE) absolutely love visiting the departments and the all of fun and memories that come with these deliveries. This event is, HANDS DOWN, our favorite event of the year. Tonight (a few days ago now), I woke after just 2 hours of sleep and couldn’t stop thinking about this campaign. A decision needed to be made and since it was clear that my brain wasn’t going to rest, I decided to get up and write this out to hopefully clear my head and get back to sleep – fingers crossed. I now come to you with this…..
WE ARE DOING CAMPAIGN #5. WE WILL (HOPEFULLY) REACH OUR GOAL OF 1/2 MILLION COOKIES DELIVERED AFTER THIS CAMPAIGN IS COMPLETED. WE WILL HAVE FUN AND WE WILL MAKE MEMORIES. What I need from you is help! I don’t have time to get to too much training in but will utilize some of those helping hands I mentioned above in a few ways I know won’t need a ton of guidance. If we are going to meet the 500,000 goal, we need 86,002 cookies from what I have already accounted for with the approved leaders to date. I have a decent list to get through so this number will go up with what I already have on the leader list but I know now it won’t be near enough. I expect we will need another 50K by time I get through all of that. APPROVED LEADERS: If you are an already approved leader and have friends that want to pick up departments, I give you (as I always have) the ability to act as their approval method. What changes this year is that you can communicate with me (allowing them to bypass the leader list request form completely). How will this work? APPROVED LEADERS can email me the name, email address, and the specific departments (with city and state) their friend / family would like to cover. I will have the leader list up soon but just in case, make sure they know that they are not officially the leader for that/those department(s) until they get the final approval email from me listing their departments. This is to ensure that I don’t already have back-end work happening with those departments spoken for with another. Greater Cincinnati / NKY area departments tend to go early but sometimes leaders drop off so openings may exist. SPONSORS: We need help with the huge list of supplies needed and the cookies to deliver. If you are in a position to sponsor either with a financial contribution or via our wish-list (or the wish-list in your area), please reach out. Please bear with me as I am going to be crazy to the extreme making this all happen. Most of my work will be on the weekends so if you aren’t hearing back from me during the week, please understand. I will be in touch soon. As I’ve mentioned, I am crazy, crazy busy so bear with me as I get through things and get to you with your assignments and answering emails. IF YOU ARE WITH A LAW ENFORCEMENT OR FIRE DEPARTMENT, know we can’t wait to see you. So many of you have been so welcoming and have created an environment that makes us want to return to tell you, year after year, just how much we appreciate you. Our official delivery week is set for October 15-19 so make sure to be ready because loads of #sweetkindness will be heading your way!